April is Fanworks Month, where we take a break from the show for a few weeks and celebrate the creativity of the brony community by examining fanworks with the same seriousness and critical eye as regular episodes. This week is the crossover fanfiction Time Lords and Terror by Hephestus. You were expecting somepony else? It’s November 23, 1963 and June 6, 1986 and March 26, 2005 and October 10, 2010, and a children’s show is beginning that will eventually have a strong adult following as a massive geek hit. Mostly, though, it’s somewhere around April 2011 (finding the precise date at which a fanfic posted turns out to be surprisingly difficult), so if you really want to know what’s going on in the world, read the Season 1 posts from “A Bird in the Hoof” on. For starters, we have to address something important: This story is, from an objective, technical standpoint, not very good. It’s amateur work made by an amateur, as fanfiction almost always is (Neil Gaiman being the obvious exception). There are frequent punctuation errors, especially comma splices. The diction is extremely uneven: some scenes feel like the author was consulting a thesaurus throughout, especially in the early chapters, while others use the much plainer and simpler language with which the author is clearly more comfortable. The characterization is extremely basic, and the plot makes heavy use of lucky coincidences and deus ex machina resolutions. None of which matters, because this is a story that reimagines the villains of 1986’s My Little Pony: The Movie to fit them into the Doctor Who canon, and then has the Doctor team up with the modern-day Mane Six to fight them. Any remotely readable story with a premise that glorious would be enjoyable, and this story manages to be more than remotely readable and therefore immense fun. There is a feeling of inevitability to crossing over Friendship Is Magic and Doctor Who. Not just because both series are popular among a pretty similar group of people, or because there was a background pony with an hourglass cutie mark who vaguely resembled a pony version of the Tenth Doctor. There’s a host of reasons why this crossover had to happen sooner rather than later. The most superficial is the mirror nature of the shows’ default plots. 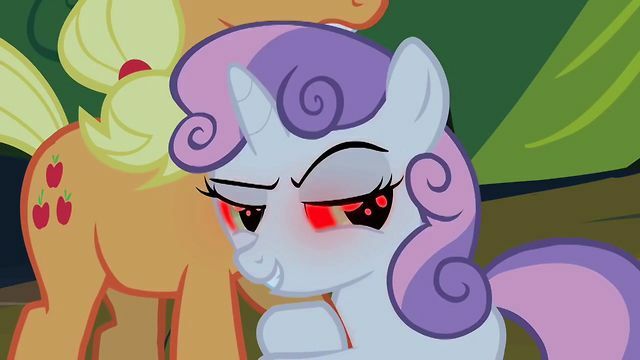 After “everypony in this town is crazy,” the second-most-common premise for a Friendship Is Magic story is that some alien element enters Ponyville (or, if it’s a season premiere or finale, Equestria), accounting for 23 of the 61 stories in the first three seasons. The go-to standard plot for Doctor Who, meanwhile, is that the Doctor arrives in some place or time and serves as an alien element that stirs things up. A more important reason requires explaining Doctor Who a bit. The Doctor generally arrives via TARDIS, a magical blue box that is also a machine, the point at which Clarke’s Law and alchemy collide into something that doesn’t so much travel through time and space as smash its way from genre to genre. Doctor Who can be (to use the three most recent episodes at the time of writing this essay) a Victorian horror story about possessed snow in one story, a modern-day techno-thriller about people being forcibly uploaded to the Internet the next story, and a fantasy-space adventure about balancing the importance of story and memory with the need to defy authoritarian belief systems that feed on those stories in the third story. What makes them recognizable as Doctor Who stories is the presence of four key elements (and a hat tip to the ever-brilliant Philip Sandifer for laying these out in his article on “The Dalek Invasion of Earth”). First is the TARDIS, the liminal space that bridges the familiar and the strange, a sort of cross between Platform 9 ¾ and the Enterprise, able to change which Faerie it links to every story. Second are the monsters, the reification of the strangeness the TARDIS brings, sometimes terrifying, sometimes benign, and always alien and weird. Third is the Doctor himself, the ancient wizard-scientist (alchemist, in other words) who jumps from story to story so he can play with the monsters. The Doctor is a mercurial figure, always transformative and transforming, not just in his famed regenerations when he changes face and personality, but in his ability to swing between moods and moral statuses mid-scene and even mid-line. Part trickster god who destroys systems he finds unworthy, part wandering adventurer, part eccentric Victorian inventor, and part bum, he is the cosmic hobo and the hobo cosmic. Last but not least are the companions, who serve as a restraint on the Doctor. He loves them, wants to protect them and have them think well of him, so they are able to hold him back when he goes too far and spur him to action when he’s fooling around too much. 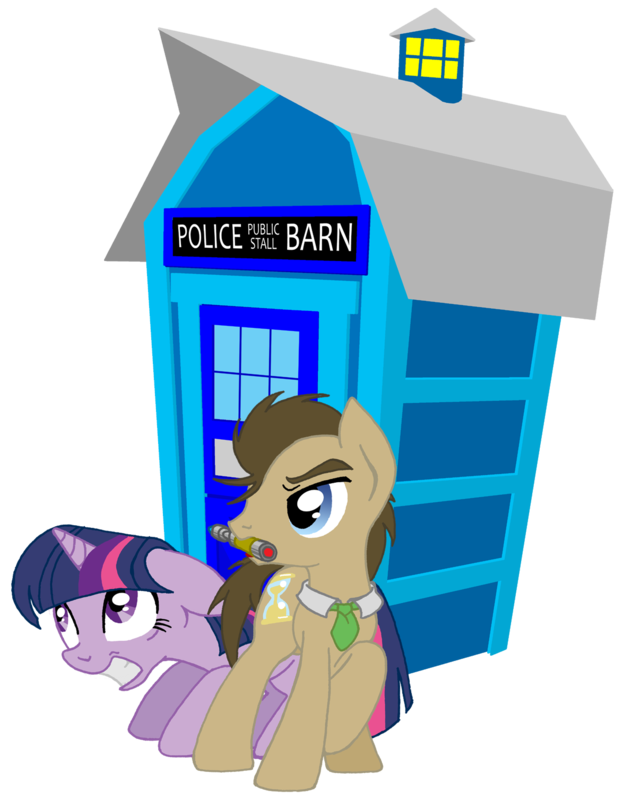 The TARDIS goes where the Doctor is needed, not where he wants, so of course it lands in Equestria. Not so the Doctor can save everypony from the villains; the story establishes from the start that the only reason the witches land in Equestria is the appearance of the TARDIS, not the first time it’s been suggested that the Doctor brings the monsters. No, he’s not here because Equestria needs him; he’s here because, with Season One drawing to a close, Friendship Is Magic needs him. The series has increasingly found itself trapped in the constraints it laid down for itself, and it needs to break free. It needs a force of chaos, a harbinger of change, a mercurial being who tears down oppressive systems and then wanders away, leaving others to pick up the pieces. All season, as I’ve mentioned repeatedly, there has been a recurring theme of change and transformation. It’s employed some powerful symbols of that concept: the Eclipse, the Dawn, the Phoenix. Our culture has no shortage of symbols of the power of change to tear down old orders that seem unbreakable–it’s one of the functions of the Cross, among other symbols. But for me, the single greatest symbol of global transformation, the breaking of the world that lets a new world grow in its ruins, is the Police Box, and the odd man who lives inside. To make a long story short, the series has increasingly found itself trapped in the constraints it laid down for itself, and it needs to break free. It needs a force of chaos, a harbinger of change, a mercurial being who tears down oppressive systems and then wanders away, leaving others to pick up the pieces–and of the two such beings in long-running English-language TV science fiction franchises, the Doctor is by far the more benevolent. But what, precisely, does it need him to do? As I mentioned in discussing “Double Rainboom,” crossovers are generally at their best when using one set of source material to comment on the other. The best crossovers use both to comment on both simultaneously, and that very nearly happens here in perhaps the greatest moment of the story, the moment at which two unstoppable forces of generally benevolent chaos collide, and Pinkie Pie meets the Doctor. Now, Pinkie Pie is not the main companion here. There’s a clear hierarchy to the characters, which I suspect but cannot confirm has to do with how much the author likes them. Twilight is clearly the companion who gets closest to the Doctor, and the one who resolves the plot in the end. Rainbow Dash and, weirdly, Applejack and Zecora form the next tier; they do not have the rapport with the Doctor that Twilight does, but they do get to be very useful. Finally, Fluttershy, Rarity, and Pinkie Pie have almost no impact on the plot and appear to be there just to fill out the “Doctor meets the Mane Six” requirement, with Rarity not even showing up until the third act. Despite this, the two characters who get the best scenes with the Doctor are Pinkie and, to a lesser extent, Fluttershy. Pinkie meets the Doctor once before the team-up really gets rolling, and it’s delicious. First, the Doctor (who is definitely Ten here, despite an error at one point that implies he’s already regenerated ten times and is therefore Eleven) employs one of his typical character tics and asks a question to which he is the only person present who could possibly know the answer (“How many species use Z-Neutrino weapons?”) Pinkie immediately and correctly guesses the answer, throwing the normally unflappable and somewhat smug Tennant Doctor off his stride. Even better is what happens after the Doctor invites the Mane Six into the TARDIS: while everyone else goes through the usual “flabbergasted at it being bigger on the inside” set piece, Pinkie vanishes into the depths of the TARDIS, eventually finding the pool and library (they’re the same room), where she reads the TARDIS instruction manual. Keep in mind that the Doctor has never been very good at flying the TARDIS, right back to the beginning of the show. He is surprised, in this story, that it even has an instruction manual, which means Pinkie, after no more than a few minutes in the TARDIS, knows more about it than the Doctor does. Which, once stated, is obvious. Pinkie Pie is constantly dancing on the edge of the story in Friendship Is Magic, able to interact with the medium, hang off the top of the frame, or import knowledge from outside the story. The TARDIS, meanwhile, is a device for smashing the Doctor and his companions from story to story, while its interior occupies a stable “other dimension”–in other words, the inside of the TARDIS is outside any story, beyond the fourth wall. Of course Pinkie Pie has an affinity for it, of course she understands it immediately on entering it! And of course she unsettles the Doctor by doing so; he has repeatedly been shown to have quite an ego, especially the Tenth Doctor (though Three and Six could be quite self-aggrandizing, too), and the notion of not being the most potent force of genre-bending chaos in the room is extremely disconcerting for him. As I said, other than those two scenes, the main draw of this story is its villains,taken from My Little Pony: The Movie, but with the plot of that movie entirely discarded. Past and present collide, as they tend to do when Time Lords are around, but not in a literal sense; this story does not try to imply that Friendship Is Magic shares continuity with the original My Little Pony. Instead, it presents us with characters close enough to the villains of that movie to be recognizable as versions of them, but at the same time very much Doctor Who villains. By making Hydia, Draggle, and Reeka into a coven of Carrionites, the story not only makes them much more effective and frightening than they ever were in My Little Pony, but goes a long way toward redeeming the Carrionites as a part of Doctor Who lore that’s never quite fit in. Once the witches are fixed as a part of Doctor Who that sneaks into Equestria, the transformation of the Smooze into the Lovecraftian S’Müz is as inevitable as it is brilliant, as it transforms him into an occult foil for both the Doctor and the Mane Six. Most of the Doctor’s iconic villains are foils–that is, characters that share some of his traits while being his opposite in other ways. The Master is an immortal time-traveling genius, but seeks to dominate rather than engage and enjoy. The Daleks destabilize any narrative they enter and reshape it with themselves at the center, but are violent fascistic mass-murderers. 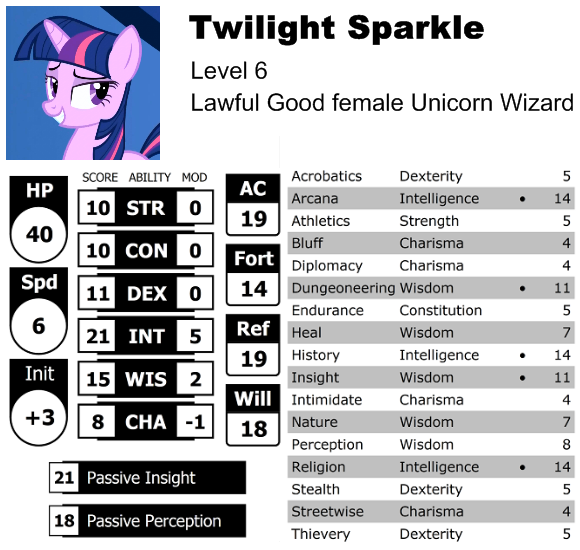 The S’Müz, meanwhile, is a foil to both the Gnostic elements of the Doctor and the Qabbalistic elements of the Mane Six. Gnosticism is an early Christian heresy, likely predating both the canonical Gospels and the (little-o) orthodox form of Christianity from which all of the modern (big-O) Orthodox, Catholic, and Protestant sects descend. Gnosticism, to oversimplify to the point of absurdity, holds that the material world is the accidental creation of an emanation of God named Sophia, and now lies in the tyrannical grip of a mad, evil entity that thinks it’s God, called Ialdabaoth. Sophia is trapped within the world she created, and the souls of humanity are her essence, sealed away in our bodies. Sophia’s male counterpart/other half, Christ (who is here explicitly not the same being as the human Jesus) entered the world to spread knowledge, bring enlightenment, free the trapped souls, and eventually destroy the prison that is material existence. Christ appeared to die, but a divine being can’t; Jesus (who was a normal, albeit enlightened, human who acted as a sort of conduit for Christ) died in his place. Qabbalah is a very complex mystical tradition with many variations, including the original Jewish version, the medieval European version that influenced alchemy, and multiple descendents and variations thereof, but for our purposes (and again to elide and oversimplify to the point of absurdity) the important part is that, as in Gnosticism, something went wrong at the beginning of time. The material universe is not itself a mistake, but the divine light that was supposed to fill it was shattered and scattered, resulting in human souls. Certain special sparks among us have the power to ignite the light of human souls, not to destroy the material world but to remove the corruption from it and transform it into something better, the originally planned perfection something created by a divine being ought to have. There’s also these things called sephiroth which would at least quadruple the length of the essay if I explained them, so for our purposes we’ll just say they represent stages on the path to enlightenment, and in some traditions have dark mirrors called the qlippoth, which represent various ways to fail to reach enlightenment. The Mane Six are pretty easy to read in a Qabbalistic way thanks to the Elements of Harmony. They possess inner light, sparks which can ignite to restore things to their proper, uncorrupted form, as they do when they transform Nightmare Moon to Luna. In the context of “Time Lords and Terror,” this light is identified as psychokinetic energy, and works more or less like mana or the Force. The Doctor, meanwhile, is very much a Gnostic figure. He is a nonhuman and superhuman savior from outside who is frequently mistaken for a human, appears to die without actually dying, possesses great wisdom and knowledge, brings enlightenment to those who listen, overthrows tyrants and destroys systems he finds unworthy (for the best example of this side of him in action, I recommend the tragically underrated Seventh Doctor story “The Happiness Patrol”). The S’Müz is a foil to both, balanced between a dark read of the Gnostic Christ and a manifestation of the qlippoth. Like the qlippoth, he is a manifestation of the primordial chaos and darkness, seeking to recover the Light taken from it at the creation of the universe. Also like the qlippoth he can be taken as a dark alternate read of an ostensibly good thing. The relationship between the Lovecraftian and the Gnostic is analogous to that between the qlippoth and the sephiroth: knowledge that brings madness/enlightenment, beings that destroy physical consensus reality without malice, the universe in the tyrannical grip of a vast, mad idiot, even the notion of an ancient alien being sealed or sleeping within the world are all found in both. If you happen to like physical existence, the Gnostic Christ is a terrifying monster that can look like a human but wants to tear out your soul and destroy the universe, not really very different from Nyarlathotep. The S’Müz as dark reflection of the Doctor works on more than just the mythical level, though. The ponies respond to them in not dissimilar ways: both are immediately obviously alien and unsettling, as when Twilight is disturbed by how ancient the Doctor’s eyes look, or when all the ponies feel frightened and nauseated by the mere sound of the S’Müz’s voice. They instinctively feel that the Doctor is trustworthy and want to impress him, and just as instinctively fear and hate the S’Müz. This mirroring of the two makes it fitting that one of the S’Müz’s first acts on arriving in Equestria is to absorb the Doctor, revealing yet another parallel. Removing the Doctor so abruptly from the narrative makes it clear just how much he has absorbed and replaced Equestria with his own mode of being. The Doctor’s usual function is to crash into some other genre of story and make it his own, and this story is no different. The Mane Six fall into companion roles swiftly, the villains are recast from their My Little Pony origins to become Whovian entities, and the general tone of more-or-less kid-friendly horror is a typical Doctor Who register. Even the main villain, for all that he works on an occult or mythic level as a foil for the ponies, only works as a personal foil for the Doctor. In short, even though it’s the Doctor who crosses dimensional boundaries to enter Equestria, the end result is that the Mane Six find themselves in a Doctor Who episode. The only way to get any element of Friendship Is Magic back into the narrative is to remove the Doctor so that Twilight can be the hero instead, and even then the solution she finds is a typically Doctor-y combination of the sonic screwdriver and technobabble (including, in the most jarringly out-of-place gag in the story, an Insane Clown Posse reference). Sandifer posited in his article on “The Reign of Terror” that the disappointing episodes of Doctor Who, the ones ripe with potential that never quite clicks, are a large part of why the series could potentially continue forever. If so, then the same is true of fanfiction: the compellingly awkward works, the ones whose reach exceed their grasp, are often the ones that stay with the reader. We remember the potential and the brilliant bits, while the awkward prose and shaky characterization fade. More to the point, we remember the almosts and might-have-beens, things the story almost but not quite managed to do, and take joy as much from them as from the things that worked. Next week: More genre collision, this time with the intrusion of ponies into a genre still in its infancy. No, not the one you’re thinking of. This one has more dice, fewer robots, and updates much more often. 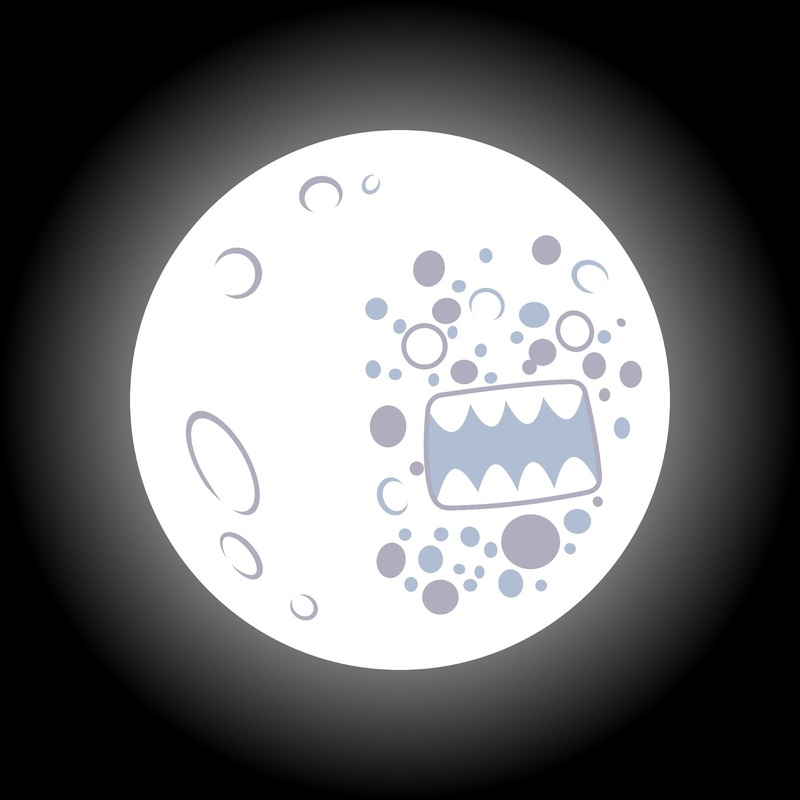 episode when Celestia banished Domo-Kun to the moon? April is Fanworks Month, where we take a break from the show for a few weeks and celebrate the creativity of the brony community by examining fanworks with the same seriousness and critical eye as regular episodes. This week is the fan animation “Double Rainboom” by FlamingoRich and a small army of associates. It’s March 30, 2013. The top song is “Harlem Shake,” because corporate media love memes, and the top movie is “G.I. Joe: Retaliation,” because it’s March 30 and there won’t be any actually good action movies for at least two months. Major news stories include the new Pope violating centuries of Catholic tradition by treating women as people, sequestration (the American equivalent to Europe’s disastrous austerity measures) taking effect in what is, to date, the single greatest triumph of right-wing obstructionism and determination to burn the world and rule over its ashes, and the Supreme Court hearing two cases regarding gay marriage bans and looking likely to overturn both. The third season of My Little Pony: Friendship Is Magic ended a few weeks ago, and hype has been building around the “fan-made episode” “Double Rainboom.” The brainchild and senior project of Savannah College of Art and Design student Zachary Rich, the project has exploded across the brony community since its inception. Hundreds of background artists, animators, and voice actors, all of them students or amateurs, have worked together to create what is being touted as a “show-accurate” production, even receiving an official nod of approval from Hasbro to pursue the project. Early in March, some of the members of the project screened the first 15 minutes of the episode at Cloudsdale Congress, and I was very excited by what I saw there. The animation was very nearly spot-on, the voices were solid, and the character humor felt like the sorts of jokes the show tells. Even the sequence of Twilight imagining how the enhancement potion would work on the different characters, though animated in a style not seen in the show, was reminiscent of both the storybook style of the legend of Nightmare Moon in the series premiere and the papercraft sequence in “A Friend In Deed,” among others. There were a few moments that felt a bit fannish throughout, especially the lengthy sequence of Rainbow Dash flying through town, sowing chaos in her wake. Some of the gags in that sequence, such as Applejack’s cart being smashed or Fluttershy fainting at the apparent vaporization of her chickens, were solid, funny character moments. However, others were pure fanservice, jokes that only those aware of fan memes would get: Scootaloo crashing into an adopt-a-chicken sign, for instance, or a certain cross-eyed pony eating a muffin. Still, overall the work seemed to be shaping up to be truly excellent, a paragon of what fanworks can be. Fan expectation was still that the episode would be show-accurate, although at the Cloudsdale Congress event one of the animators said that applied to the animation and characterization, not necessarily the jokes and plot. As it turned out, the plot most assuredly was not show-accurate, as the second half took a surprise turn into a crossover with The Powerpuff Girls. There was almost no foreshadowing of this twist: of the many other cartoons rapidly referenced in Rarity’s and Fluttershy’s segments of Twilight’s imagination sequence, only The Powerpuff Girls has allusions in both, and an empty container of Chemical X is visible when Rainbow bursts out of the lab, implying it was used in making the enhancement potion. Nothing else in the show implies that The Powerpuff Girls is in any way involved; instead, the only moment that seems coded as foreshadowing, the “troll face” and evil laughter from the potion itself, has no payoff. The crosser is clearly supposed to be a surprise: the disclaimer at the beginning of the film mentions only Hasbro and DHX Media; Cartoon Network and Turner don’t get their disclaimer until nearly 20 minutes in. Nowhere in promoting the film did its makers ever mention it was a crossover; in short, both text and metatext do nothing to warn the reader that the Powerpuff Girls are en route. We haven’t discussed metatext very much, though it will start to matter more in the second and especially third season, so perhaps this is a good time to address it. The text of a work is the work itself; it may be words, images, sounds, or in the case of a cartoon all of the above. The text contains both diegetic (exists within the characters’ universe) and non-diegetic elements (does not exist within the characters’ universe, such as most background music), but is limited to the confines of the work, independent of the packaging that surrounds the work. That packaging is the domain of metatext: all the things which are not actually a part of the work, but which nonetheless affect the audience’s experience of the work. Metatext for a typical episode of My Little Pony includes promotions and advertisements for the work, the opening and closing credits, the Hub or other network watermark, the commercials which air during breaks (or, obnoxiously, sometimes over top of the episode itself), and so on. Metatext is generally secondary to text, of course, but it can still be very important in understanding a work. Metatext helps to shape audience expectations and can influence the impact of the work. If the metatext and text work against one another, the results can be quite disappointing for the audience; classic Doctor Who, for example, had a tendency to do episodes where the revelation that the Daleks (or whoever) were the villains was a major second-act plot twist, and then display the title “Revenge of the Daleks” at the beginning and heavily advertise that the Daleks were returning. On the other hand, contrast between metatext and text can be a very effective tool; the notoriously dark Neon Genesis Evangelion has an energetic, upbeat opening credits sequence that becomes more and more ironic as the series progresses. Metatext is possibly even more important for fanworks than other kinds of works. Fanworks are very much like folklore in that they do not exist in isolation; by their very nature they are tied to a particular community and steeped in its traditions. Any fandom has its own values, beliefs, legends, traditions, and even rivalries and conflicts, which collectively form a body of lore most fans referred to as fanon (a portmanteau of “fan canon,” arising from the confusion of canon and continuity I’ve discussed previously). As with folklore, fanon is not monolithic, but exists in tension between tradition and innovation, with each fan applying their own interpretations and twists to the shared elements, some of which may then be adopted by the rest of the community. And just as any particular folktale can embrace or defy, but never ignore, its culture’s traditions, so a fanwork can embrace or deny fanon, but never simply ignore it. Even if the creator makes a point of avoiding other fans in an effort to keep from being tainted by fanon, readers will apply their interpretations of fanon to the fanwork and judge it accordingly. Fans can be a demanding and fickle bunch. Like any community, there is only so much innovation they will accept at a time; beyond that point, the defenders of tradition step in with their criticisms and their demands. There’s nothing wrong with this; it is the natural behavior of any folk culture, and we’ve all done it at some point. However, it creates an enormous pressure to conform to fan expectations. The original work, even a serial format such as a TV show, can isolate itself from this pressure–fans, in the sense of members of a community surrounding the work, are always only a fraction of the audience, and can (and usually should) safely be ignored. Fanworks, however, are products of that fan community, and therefore cannot fully isolate themselves from its pressures. The “Double Rainboom” team thus unknowingly did themselves a serious disservice by cultivating fan expectations for a “show-accurate” episode. For obvious reasons of both copyright and tonal incompatibility, Friendship Is Magic and Powerpuff Girls could never do a full crossover. References and allusions, sure–certainly there’s nothing particularly alien to the show in the notion of three cute elementary school-aged characters who go off and have adventures in which they are oddly more competent than the adults around them–but never a full crossover. Its premise makes it impossible for “Double Rainboom” to be an episode of the show, and the resulting conflict between expectation and execution–between metatext and text–left many viewers feeling disappointed. It certainly doesn’t help that the crossover is barely used once introduced. There is only a minimal amount of interaction between Rainbow Dash and the Townsville characters, and much of the time is swallowed by another reference-loaded chase sequence. One of the few ways to make a crossover really work (and we’ll get deeper into this next week) is to use the juxtaposition of the two works to comment on both, highlight the contrasts and similarities. That almost starts to happen here, with the difference in the way Rainbow Dash deals with the monster from Blossom, Bubbles, and Buttercup, but it doesn’t end up going anywhere. What “Double Rainboom” does succeed in doing, however, is to show us what a group of hundreds of fans thought other fans would want to see. They gave us is memes, allusions, crossovers, and in-jokes, like an animated version of Tumblr. These are the things of which fan culture is made, arguably (though they thankfully left out shipping), but they are not how good cartoons happen. Back in the series of articles I’ve taken to calling “Friendship Is Alchemy” I posited that the two leading categories of contemporary television for geeks are meme depots and cult shows. Cult shows are older, dating back to the 1980s and Twin Peaks, and rely heavily on metatext for their entertainment value–specifically, much of the entertainment value of a cult show is in the paranoid theorizing of fans in a conspiratorial mode, trying to guess where the show will go and figure out the underlying mysteries. Meme depots, on the other hand, are a little more recent (the earliest example I’m aware of is Family Guy in the late 1990s), and rely for their entertainment value on either generating or repeating memes that can be shared between fans. Fans, being human, are frequently blinded by their expectations. Thus many fans try to approach Friendship Is Magic as either a meme depot or a cult show. Trained by cult shows to scour every line of dialogue and throwaway reference for “clues,” fans engage in elaborate theoretical exercises to try to construct back stories and answer questions the show has never particularly asked: What happened to Applejack’s parents? What does Fluttershy do for a living? Who was Starswirl the Bearded? At the same time, trained by meme depots to find intertextuality inherently funny, they crow in delight at every allusion to another work or fan meme, and propagate every funny one-liner or cool moment as a new meme. There’s nothing wrong in any of this; it can be a lot of fun. (Ask me sometime about Sombra, Cadence, and “Hearts and Hooves Day” for my own absurd engagement with the paranoid viewing style.) The problem lies in forgetting that while some shows (Doctor Who, for instance) may be clearly operating in a cult tradition, and others (Regular Show) in a meme depot tradition, Friendship Is Magic does neither. The value of Friendship Is Magic is in its text. It’s not about familiar, easily repeatable gags, or the illusion of an overarching plot coming together to an inevitable conclusion; it’s about characters we grow to love and an opportunity to retreat to a utopian vision of a world in which everyone loves their neighbor as a person like themselves. One of the dangers in alchemical transformation is stopping too early. The xanthosis stage results in gold, which might seem quite good enough, but it is not the magnum opus, the philosopher’s stone. Like a fanwork or a folktale, mid-first-season Friendship Is Magic suffered from a tension between the old, the option of being a typical My Little Pony show, and the new, being a cult show or meme fountain in an attempt to reflect the likes and interests of a fan community of geeks. In my article on “Fall Weather Friends,” I identified the former with Applejack and the latter with Rainbow Dash. It is a very good thing that neither of them won that contest, because only by synthesizing these opposites can the rubedo stage be achieved and something truly new and transformative be created. “Double Rainboom” is like a glimpse of a dark alternate reality where Rainbow Dash won the race, and Friendship Is Magic became a meme depot. Its first half depicts the best-case scenario of that path, a reasonably funny, colorful, and well-animated, but ultimately unsatisfying and soulless, filler of time. Its second half shows where the path ultimately leads: nonsensical chaos, and a great deal of noise to no purpose. In the end, it seems the most valuable thing the “Double Rainboom” team provided the fandom is animation resources. This shouldn’t be taken as a knock to them in the slightest; creating something that other fans can use to make great fanwork is nothing to sneeze at. Already the puppets they created have been put to use in other projects–including “Snowdrop,” which despite featuring none of the mane six and being set almost entirely a millennium before the show, still manages to come far closer to capturing its spirit.